George Town, May 15, 2018 - Endeavour Mining (TSX:EDV) (OTCQX:EDVMF) is pleased to announce its financial and operating results for the first quarter 2018, with highlights provided in the table below. 1This is a non-GAAP measure. Refer to the non-GAAP measure section of the MD&A. 2Realized Gold Price inclusive of Karma stream; 3Realized Gold Price less AISC per ounce; 4Net revenue less All-in Sustaining Cost; 5Net revenue less All-in Sustaining Costs and Non-Sustaining capital; 6Adjusted EBITDA divided by Revenues; 7Based on last quarter annualized Adjusted EBITDA as management believes this is a better proxy of debt repayment capability compared to LTM due to the recent addition of Houndé. Sébastien de Montessus, President & CEO, stated: "Our strong performance in the first quarter leaves us on track to meet our 2018 guidance as each of our mines contributed in line or above our expectations. We enjoyed record production levels driven by the successful ramp up at Houndé, which is now fully-derisked and processing mainly harder fresh ore through the plant. This strong performance was also a key contributor to both the improved goup All-in Sustaining Cost, which was well below $800 per ounce for the quarter, and the significant increase in operating cash flow. At Houndé, we are seeing particularly strong cash flow as the asset has already generated over $100 million in All-In Margin since commercial production began in November last year. We look forward to further inceasing the quality of our portfolio with the Ity CIL project which is progressing on budget and on time for first gold pour in mid-2019. Finally, we are continuing to generate positive results from our exploration program, with efforts during Q1 mainly focused on the Kari discovery made at Houndé last year for which we expect to issue results in the coming weeks, and at Kalana for which we expect to publish an updated resource by mid-year." Production from continuing operations increased by 39% compared to Q1-2017, marking a significnant improvement mainly due to the addition of the Houndé mine which more than offset the expected declines at Agbaou (due to temporary lower grades as mining focused on waste capitalization), Karma (due to temporary lower grade mine sequence and lower recovery rate associated with transitional ore) and Tabakoto (due to the depletion of high-grade Kofi C deposit), while Ity production increased slightly. Production from continuing operations increased by 3% compared to Q4-2017 due to increases across Houndé (first full quarter in operation), Karma (increased stacking capacity following the new front-end commissioning in Q4-2017), Tabakoto (higher open pit grades), while Ity increased slightly, which more than offset the expected Agbaou decrease (due to aforementioned temporary lower grades). AISC from continuing operations decreased by 14% compared to Q1-2017 mainly due to the addition of Houndé and decreases in both Corporate G&A and Sustaining Exploration per ounce, and a decrease at Ity which more than offset the anticipated increases at Agbaou (harder ore mix and lower grade), Tabakoto (due to the depletion of high-grade Kofi C deposit), and Karma (aforementioned temporary lower grade and lower recovery). AISC from continuing operations remained flat compared to Q4-2017 due to the anticipated increase at Houndé and Agbaou which was offset by decreases at Tabakoto, Ity, and Karma. Consistent with Endeavour's portfolio management approach, a strategic review is underway on Tabakoto. For Q1-2018, the group AISC excluding Tabakoto amounted to $685/oz. Production increased as the mine benefited from a full quarter of production after commencing commercial production on November 1, 2017. Ore tonnes significantly increased due to a full quarter of mining. As expected, mine capacity ramped up to 10.3Mt moved, representing an annualised run-rate of over 40Mt thereby outperforming the feasibility study assumption of 32Mt based on the same equipment due to better than anticipated productivity. In line with design characteristics, mining and processing activities moved from mainly softer oxide material to roughly 80% harder fresh ore.
Tonnes processed increased due to a full quarter of production, and despite the transition to harder material, the average tonnes processed per hour increased from 407 to 450. The annualised run-rate of 3.6Mt per annum is currently outperforming the 3.0Mt per annum nameplate capacity by 20%. The average grade milled decreased slightly due to the anticipated mine sequence, remaining well above the 2.02 g/t reserve grade. Recovery rates remained steady at 95%, outperforming the feasibility study estimate of 93%. AISC amounted to $433/oz in Q1-2018, with unit costs comparing very favourably to metrics presented in the feasibility study. Mining unit costs increased from $1.33 to $1.58 per tonne as mining shifted from softer oxide material in Q4-2017 to harder fresh ore in Q1-2018, remaining well below the feasibility study estimate of $2.17 per tonne. Processing unit costs increased from $6.81 to $10.91 per tonne milled due to the transition to fresh ore, remaining well below the feasibility study estimate of $13.36 per tonne. No sustaining capital spend was incurred in the quarter. Non-sustaining capital decreased from $14.5 million to $1.6 million as the pre-stripping at Vindaloo Main was completed in Q4-2017. Houndé is well on track to meet its full-year 2018 guidance of 250-260koz at an AISC of $580-630/oz. In-line with the guidance, the production rate is expected to slightly decline in the upcoming quarters while AISC are expected to increase as a reflection of lower expected grades and higher strip ratio. In 2018, Houndé will be the strongest focus for Endeavour with a $9 million exploration program totaling approximately 125,000 meters planned with the aim of drilling the entire Kari anomaly and delineating a maiden resource on 2017 Kari Pump discovery by the end of 2018. In Q1-2018, a total of nearly 73,800 meters had already been drilled, mainly focused on the Kari anomaly, with further high-grade mineralization confirmed. Results are currently being analyzed and are expected to be announced in the coming weeks. Production decreased in line with expectations as low-grade stockpiles supplemented the mine feed to allow waste capitalisation activities to progress to give future access to higher grade areas. Total tonnes moved increased from 7.2 million tonnes ("Mt") to 8.0Mt as waste capitalisation activities increased which resulted in less ore mined. Mill throughput decreased slightly, but remained at a high level as the proportion of fresh ore processed increased from 25% to 31%. Average processed grades decreased mainly due to lower grade stockpiles supplementing the mine feed. Recovery rates remained constant despite a greater proportion of fresh ore.
All-in sustaining costs increased from $690 to $752 per ounce mainly due to increased sustaining capital spend, lower milled grade, and the cost impact of transitioning towards mining a greater proportion of fresh ore.
Mining unit costs increased from $2.68 to $2.88 per tonne mainly due to mining at deeper levels as well as mining a higher proportion of fresh ore. Processing unit costs decreased from $8.07 to $7.80 per tonne mainly due to cost savings realised on reagents following the implementation of a group procurement strategy, despite the higher blend of fresh ore processed. Sustaining capital costs increased by $1.2 million due to more equipment mobilised by the mining contractor. Non-sustaining capital increased by $5.6 million to $8.0 million mainly due to waste capitalisation activities. 2018 is expected to be a transition year for Agbaou with a focus on waste capitalisation, which is expected to give future access to high grade areas. Production is expected to increase, specifically in the latter portion of the year as the waste capitalization activities are expected to give access to higher grade areas, while costs are expected to trend towards the guided range as the hard ore blend increases. A $4 million exploration program totaling approximately 16,000 meters has been planned for 2018 with the aim of delineating the at-depth potential of the North pit, extension drilling at the West pit, and further investigating targets on parallel trends. In the latter portion of Q1-2018, the drill rigs were mobilized and drilling began with nearly 1,800 meters completed by quarter-end. Production increased and was slightly above expectations due to increased stacking capacity following the commissioning of the new front-end in Q4-2017, performing 25% higher than nameplate capacity. As expected, mining activities focused mainly on mining transitional ore from the GG2 deposit as mining oxide ore at the Kao deposit commenced in March. Ore tonnes mined significantly increased due to the lower strip ratio and the higher stacking capacity. Stacking increased following the commissioning of the new front-end and ADR plant in Q4-2017, achieving an annualized run-rate of nearly 5Mt per annum, significantly out-performing its 4Mt per annum nameplate capacity. Stacked grade decreased to due usage of low-grade stockpiles as stacking capacity performed above nameplate. As guided, recovery rates decreased due to stacking of greater amounts of transitional ore from the GG2 deposit. Recovery rates are expected to increase in the second half of the year as mining activities are expected to focus mainly on oxide ore from the Kao deposit. AISC decreased mainly due to decreased stacking and G&A costs associated with greater volumes, which were partially offset by higher mining costs. Mining unit costs increased from $1.75 to $2.51 per tonne due to the increased drill and blast, as well as haulage costs associated with mining transitional ore from the Kao deposit. Processing unit costs decreased from $8.15 to $7.84 per tonne due to greater economies of scale following the commissioning of the new front-end and ADR plant. Sustaining capital costs decreased by $0.4 million to $0.7 million mainly due to a decrease in capital stripping costs. Non-sustaining capital spend decreased by $9.0 million to $3.2 million mainly due to the end of the optimisation project in Q4-2017. As mentioned, Q1 production was slightly above expectations due to higher nameplate stacking capacity, albeit at slightly higher than expected AISC due to the additional unbudgeted lower grade stacked ore, ultimately resulting in incremental free cash flow. In line with guidance, production is expected to increase and AISC is expected to decrease in the second half of the year as mining activities transition to the oxide ore from the Kao deposit due to its higher recovery rate and lower unit costs. A $2 million exploration program totalling approximately 32,000 meters has been planned for 2018 with the aim of delineating Indicated resources at both North Kao and Yabonsgo, in addition to near-mill targets such as Rounga and on the recently acquired Zanna exploration license. In Q1-2018, more than 12,000 meters had already been drilled, mainly focused on the Eastern extension of the Kao North deposit and on Yabonsgo. Production increased due to higher grades stacked as mining activities refocused on the high-grade Bakatouo pit as metallurgical testing performed in the quarter resulted in positive recovery in the heap-leach environment, initiating a change in mine plan from the prior quarter. Tonnes of ore mined decreased due to the harder material encountered at the Ity pit as well as low excavator availability. Ore stacked slightly decreased due to the focus on stacking the high-grade Bakatouo ore. The stacked grade increased due to the change to stacking Bakatouo ore.
Recovery rates decreased slightly due to the change in ore type throughout the quarter. AISC decreased mainly due to lower sustaining capital costs, lower general and administrative costs and greater gold volume sold, which were partially offset by increased unit mining and stacking costs. Mining unit costs increased from $3.27 to $4.98 per tonne mainly due to longer haul distances and more fleet maintenance. Processing unit costs increased from $13.85 to $14.67 per tonne due to lower tonnes stacked and greater reagent consumption. Sustaining capital costs decreased by $1.8 million to $0.8 million mainly due to critical spares purchased in the prior quarter. There was no non-sustaining capital spend in the quarter. As guided, 2018 is expected to be a transition year for the heap leach operation with greater priority given to the CIL construction activities. A specific mining strategy has been set to address both the needs of the heap leach operation and the CIL project. Open pit mining activities for the heap leach operation are expected to intensify in the upcoming weeks with the addition of a contractor and continue until early Q3-2018. The aim is to create a stockpile sufficient to feed stacking requirements for the second half of the year. In the second half of the year, greater mining focus will be given to the CIL project. A $3 million exploration campaign has been planned in 2018 to further explore near-mill targets (including testing of extensions at the Mont Ity, Bakatouo, Daapleu, and Le Plaque deposits) with the aim of delineating additional resources for the CIL project. In Q1-2018, a total of over 15,000 meters had already been drilled, mainly focused on the Mont Ity deposit and Le Plaque area. Production increased mainly due to higher average head grades. Open pit ore mined significantly increased due to the start of mining at Tabakoto North as pre-stripping activities ended in Q4-2017. Underground tonnes mined remained steady as the low equipment availability was boosted through supplemental vehicles being rented temporarily while maintenance is completed on Tabakoto's vehicles in Q2-2018. Processing activities continued to perform well, with throughput remaining steady. 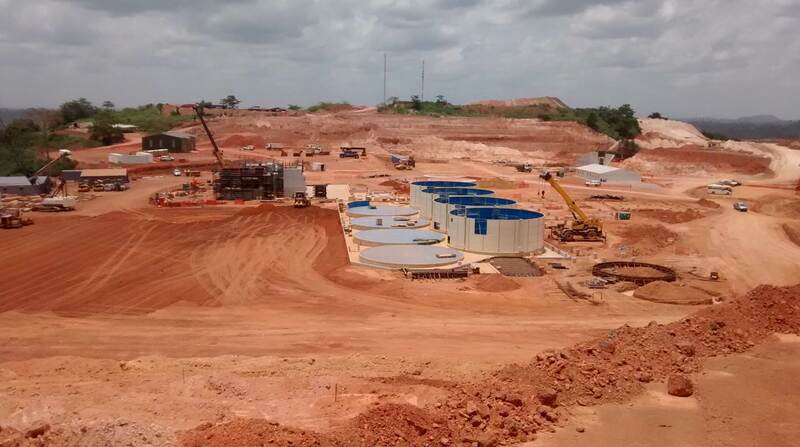 The average gold grade milled increased mainly due to higher open pit grades from Tabakoto North. The recovery rate remained flat. AISC significantly decreased due to increased production and overall lower unit costs which more than offset higher sustaining capital costs. Open pit mining costs decreased from $2.99 to $2.65 per tonne due to low grade control drilling requirements associated with the Tabakoto North deposit. Underground mining unit costs decreased from $74.90 to $71.38 due to lower maintenance costs in the quarter as mining was performed with rented equipment. Processing unit costs decreased from $20.22 to $18.41 per tonne as cyanide and lime consumption was reduced to interact with the characteristics of the ore blend processed. Sustaining capital costs increased by $1.7 million to $6.2 million mainly due to spares received for the heavy mobile equipment. Tabakoto is on track to meet its full-year 2018 guidance of 115-130koz at an AISC of $1,200-$1,250/oz. In line with Endeavour's portfolio management strategy, a strategic assessment is expected to be made on Tabakoto during the course of the year. A $7 million exploration program totalling approximately 45,000 meters has been planned for 2018, equally allocated on near-mill targets (both underground and open pit) and on greenfield targets on both the Kofi permit and on the new permits acquired in 2017, located immediately north of Kofi and on-trend with Randgold's Loulo deposits. In Q1-2018, nearly 5,000 meters had already been drilled on greenfield open pit targets on the Kofi trend and over 6,000 meters in the underground mines. Construction is progressing well and remains on-time and on-budget with the first gold pour expected in mid-2019. Overall project completion stands at 30%, tracking in line with the project schedule. Zero LTI's across the project charter to date with over 1.8 million man-hours worked. 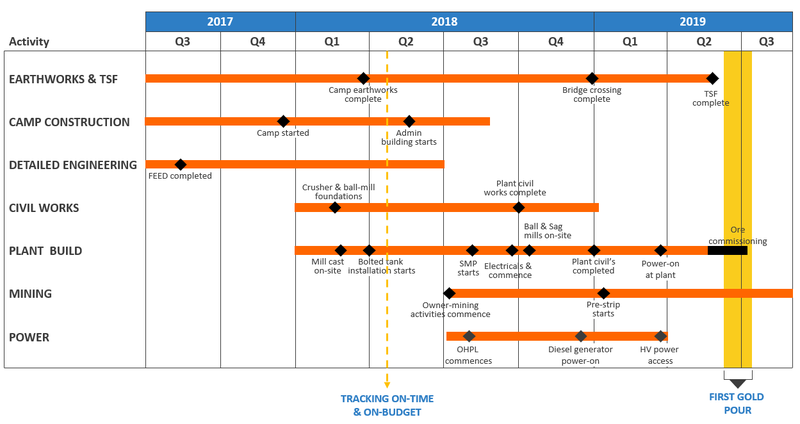 Camp construction progressed well with ~250 rooms already available for occupation. Civil works are progressing well with the crusher and ball-mill foundations completed as planned. Plant build is progressing well against schedule as the CIL bolted tank and steel framed installation began. Earthworks excavation for the 90KV transmission power line station is ongoing with erection of towers underway. Ceasing the current small-scale operations and clearing the underground workings and existing infrastructure to allow for the development of future open pits, as well as to establish access for exploration. Resuming exploration activities on both the Kalana deposit and nearby targets including Kalanako. Launching a revised Feasibility Study with the goal of increasing the current plant design capacity to increase the average annual production and shorten the mine life based on current reserves, integrating the exploration results from the upcoming drilling campaign, whilst leveraging Endeavour Mining's construction expertise and realized operating synergies. Dedicated Kalana Project Community Relations and health, safety and environment teams were created to validate the census and stakeholder mapping, with the aim of defining a resettlement action plan before relocation activities commence. An intensive exploration program is underway with nearly 37,000 meters already drilled by quarter-end, representing a significant portion of the 45,000 meters planned for the year. An updated resource is expected to be published by mid-year which will form the basis of the updated feasibility study which is expected to be completed by Q1-2019. Exploration continued to be a strong focus in Q1-2018 with a company-wide exploration spend of $20.0m, with details by asset provided in the above mine sections. The main focus in Q1-2018 was on the Kari discovery made at Houndé last year, with results expected to be published in the coming weeks, and at Kalana where an updated resource is expected to be published by mid-year. Q1-2018 gold sales from continuing operations totaled 185koz, up from 133koz in Q1-2017, mainly due to the successful start-up of Houndé. The Q1-2018 realized gold price was $1,298/oz (net of the impact of the Karma stream) compared to $1,185/oz in Q1-2017. The Group's Q1-2018 All-In Sustaining Margin (inclusive of discontinued operations) increased by 111% from $46 million to $97 million due the successful start-up of Houndé, higher realized gold prices and an AISC decrease at Ity which more than offset the anticipated AISC increases at Agbaou, Tabakoto, and Karma. Non-sustaining capital spending increased by $7 million in Q1-2018 over the same period of last year mainly due to a $6 million increase at Agbaou for its waste capitalization activities, while sustaining exploration efforts increased by $8 million over the same period to $15 million, in line with the Group's strategic focus on exploration. The All-In Margin increased by 113% in Q1-2018 compared to Q1-2017, amounting to $68 million, as the increased production at both a lower average cost and higher realized gold price more than offset the doubling of non-sustaining expenditures. Net Free Cash Flow from Operations in Q1-2018 was impacted by a negative $46 million working capital variation mainly due to a $23 million outflow of inventory (due to a temporary increase of consumable inventory at Tabakoto, Ity and Karma, an increase in stockpiles at Houndé and Agbaou as the mines begin to ramp-up stock for the rainy season, as well as an increase of gold-in-circuit at Ity) and $26 million outflow of trade and other payables (due to large supplier payments made at Agbaou, Ity and Karma, as well as the payment of accrued 2017 salaries). Q1-2018 had a net cash variation of negative $79 million mainly due to the expected $78 million growth project spend, related primarily to the Ity construction. In Q1-2018, $280 million was repaid on the revolving credit facility ("RCF") and $330 million was received from the convertible notes issuance. Certain line items in the table above are NON-GAAP measures. For more information and notes, please consult the Company's MD&A. Net cash flow from operating activities during Q1-2018 was $48 million, down $5 million over Q1-2017 due aforementionned negative $46 million working capital variation. Net cash used in investing activities during Q1-2018 was $119 million, which included $78 million of growth project capital, $24 million of sustaining and non-sustaining mine capital expendidures, $17 million of sustaining and non-sustaining mine exploration. Net cash generated in financing activities during Q1-2018 was $42 million, which included $330 million received from the issuance of a convertible notes and a repayment of $280 million on the RCF. Equipment financing increased since year-end 2017 due to a $29 million increase for the CIL project after receiving the first equipment batch from Katmasu. As anticipated, net debt increased from $232 million at year-end 2017 to $336 million as of March 31, 2018, mainly due to growth project spending and negative working capital variation. The Company remains in a healthy financial position with a Net Debt / Adjusted EBITDA ratio of 1.24 times based on a trailing last 12-month Adjusted EBITDA and of 0.86 times based on annualizing the last quarter, which due to the recent addition of Houndé may be considered as a more relevant metric. At quarter-end, Endeavour's available sources of financing and liquidity totalled $424 million which included its $94 million cash position and $330 million undrawn on the RCF. In addition to the aforementioned liquidity sources, Endeavour also has strong cash flow generation, upcoming second half of Ity CIL equipment financing, and the remaining proceeds from the Nzema sale. Net Debt and Adjusted EBITDA are NON-GAAP measures. For a discussion regarding the company's use of NON-GAAP Measures, please see "note regarding certain measures of performance" in the MD&A. Due to the start-up of Houndé, operating cash flow before non-cash working capital increased by 98% over Q1-2017 to $95 million, representing $0.88/share. Operating Cash Flow Per Share is a NON-GAAP measure. For a discussion regarding the company's use of NON-GAAP Measures, please see "note regarding certain measures of performance" in the MD&A. Q1-2018 adjusted net earnings from continuing operations increased by 258% over Q1-2017, due to the significant operational improvement, amounting to $43 million. Q1-2018 total adjustments of $15 million were primarily related to loss on financial instruments and other non-cash adjustments, deferred income tax recovery, and stock-based expenses. Adjusted Net Earnings is a NON-GAAP measure. For a discussion regarding the company's use of NON-GAAP Measures, please see "Note Regarding Certain Measures of Performance" in the MD&A. Management will host a conference call and live webcast on Tuesday May 15th at 8:30am Toronto time (EST) to discuss the Company's financial results. The conference call and webcast will be available for playback on Endeavour's website. Jeremy Langford, Endeavour's Chief Operating Officer - Fellow of the Australasian Institute of Mining and Metallurgy - FAusIMM, is a Qualified Person under NI 43-101, and has reviewed and approved the technical information in this news release. Endeavour operates 5 mines across Côte d'Ivoire (Agbaou and Ity), Burkina Faso (Houndé, Karma), and Mali (Tabakoto) which are expected to produce 670-720koz in 2018 at an AISC of $840-890/oz. Endeavour's high-quality development projects (recently commissioned Houndé, Ity CIL and Kalana) have the combined potential to deliver an additional 600koz per year at an AISC well below $700/oz between 2018 and 2020. In addition, its exploration program aims to discover 10-15Moz of gold between 2017 and 2021 which represents more than twice the reserve depletion during the period.